An outstanding copy of a scarce and important work. 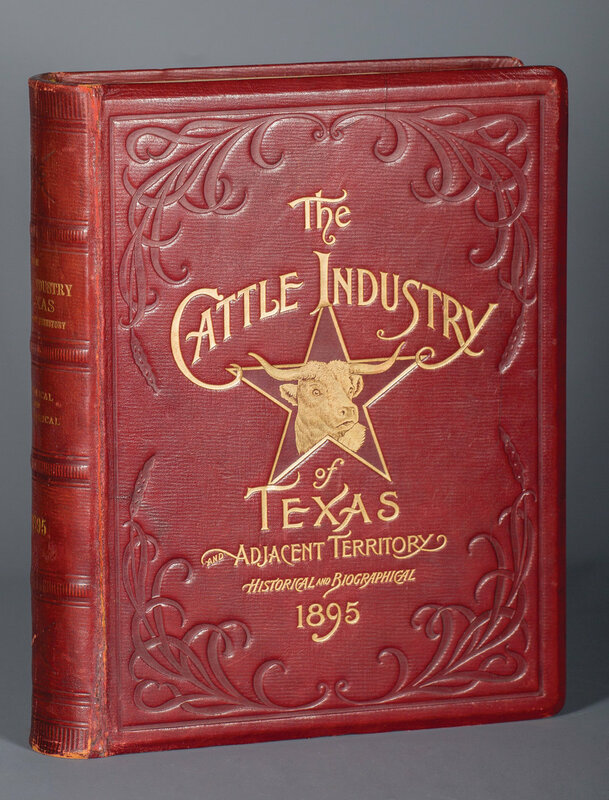 “The Cattle Industry of Texas and Adjacent Territory: Historical and Biographical, 1895”. By James Cox. First Edition. Woodward & Tiernan Printing Co. Saint Louis. “Presentation Copy in Full Crimson Morocco” leather, this is the only known copy in this original presentation binding. Signed "Compliments - Woodward & Tiernan Printing Co - Nov. 1906 - St Louis Mo." in ink. Color frontispiece, "A Stampede" is present and sharp. One of the "Big Four" cattle books. With custom case. Edges show slight wear. Graff 891; Herd 593; Howes C820; Merrill Aristocrat, page 17; Adams "Six-Score" 24; Jenkins Basic Texas Books 34. Lot 627, Brian Lebel's Old West Auction - January 25-26, 2019. Mesa, AZ.